If you are wondering what the best computers for seniors are, and you are in a bit of a hurry, the following short paragraph should help you get the right device. After comparing the many available products and the most popular senior computers reviews, we have concluded that the model you should get is the Microsoft Surface Platinum. The laptop comes with a high-performance Intel Core i5 processor, 128GB of storage and 4GB of RAM. With these specifications, the computer will not slow down even after years of use and updates of the OS. What’s more, you are not limited to just using the keyboard and touchpad. With this option, your senior will also be able to make use of the stunning touchscreen display with an ultra-thin bezel. If by any unfortunate event our first choice is not available for sale, we recommend that you consider getting the Samsung Chromebook 3 as your second best alternative. The Microsoft computer delivers outstanding performance without sacrificing on battery life and portability. It features the 7th generation of Intel Core i5 processor, 128GB of storage, 4GB of RAM and a big enough battery that can offer up to 14.5 hours of video playback. The product description says that the laptop comes with Microsoft Office, but users have discovered that what you get is, in fact, a 30-day trial, which is very misleading. If spending more money for a high-quality product is not a problem for you, the Microsoft Surface Platinum is a great purchase for people that care about portability, performance, and battery life. The screen of this option is excellent even in bright environments which is a great feature for a product intended for seniors. The viewing angles are excellent and the keyboard is spill-resistant. If used only for video playback, you can get a battery life of up to 11 hours. Customers have complained that ChromeOS, which is the operating system of this model, can be rather slow sometimes, and that the computer tends to freezes randomly. 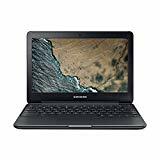 The Samsung Chromebook 3 is a great computer for seniors that want a device they can use for video playback, internet browsing, e-mailing, and communicating with their loved ones. The Intel Celeron processor offers enough performance for all your daily tasks without being too taxing on the battery and allowing users to get up to 7 hours of battery time. The anti-glare HD 15.6” screen offers great viewing angles and good performance in bright conditions. The 2GB of RAM may act as the limiting factor if you like to do a lot of multi-tasking and use lots of your favorite apps at the same time. For the average user, this shouldn’t be a problem. For people that are on a tight budget but don’t want to compromise on quality and reliability, the Acer Flagship CB3-532 is a very affordable laptop that has garnered numerous positive reviews. To make the task of finding the best senior computer that much manageable, we have gone and selected some of the products that stood out to us due to their quality, fair price, and usability. Take a look below and see if you won’t find the perfect gift for retired men and women. The Microsoft option is built to offer the perfect balance between performance and portability. The computer weighs only 2.76 pounds, and it packs all the useful features that can be found in a desktop alternative. The compact nature of the device will also make it easy for all elderly citizens to use it comfortably in their nifty lightweight wheelchair. If you don’t want to teach your granddad about how to use the keyboard or the mouse, you can instead use the stunning screen that responds to touch. Thus, if the person you intend to get this device for is accustomed to using the latest senior cell phone, he or she should have no problems with the intuitive touch interface of Windows 10. What’s more, despite the small size of the Microsoft Surface, you get a powerful battery that is capable of offering up to 14.5 hours of battery life, ideal for use in the park or on the porch. This option comes with an excellent screen that offers an incredible brightness to make it readable even in bright environments so that your grandma won’t have to squint her eyes. The viewing angles are also more than decent, allowing you to see all the colors from around 45 degrees on either side. If you plan to get a great laptop for the elderly to use to catch up on their favorite tv shows, news, and game shows, the colors on the Chromebook 3 display puts other computers in this price range to shame. You also get 4GB of RAM and an Intel processor clocked at 2.48 GHz that offers excellent performance while remaining battery-friendly. To make things even better, the keyboard does not only feel comfortable to the touch, but it is also spill-resistant. Your elderly relative can use this computer while journeying in his or her favorite travel wheelchair without having to worry that a shaky hand will spill disaster. If affordability is on your mind, you can’t go wrong with this Chromebook option, especially as it is the only Chrome OS option on our list that features a 15.6-in screen. The generous display will make it easier for a senior that has eyesight problems to get a better view of the text and videos shown. While certainly thicker and bigger than the majority of 11 and 13-n Chromebooks, this option still manages to remain portable enough for the needs of an elderly. Design wise, the laptop is practical; it employs a simple design that is much more likely to appeal to an old person. When it comes to performance, there’s nothing to complain about this unit. For a highly affordable choice, the processor, integrated graphics, and the 2GB of RAM are more than enough to handle everyday web browsing, video playback, YouTube watching or word processing. Looking for a lovely gift for retired teachers or seniors that are more tech-savvy? The Acer Aspire is a series long-known for the performance it offers in the mid-range category. With this unit, you get the latest Intel Core i5 processor, combined with 8GB of RAM, 256GB SSD and the latest MX150 graphics card from NVIDIA. Because the Acer option uses only the latest components, you will be able to enjoy more power and more battery life without having to sacrifice on portability. The Full HD 15.6-in display will make movies and games jump right out of the screen. The sound is also impressively loud and clear so that you can give your grandpa’s trusty hearing aid a break. Another feature that the elderly will love comes in the form of the backlit keyboard which will make it easier than ever to type in the dark. The Acer Chromebook is another affordable option that comes with lots of features that are quite handy for the elderly. You get hardware that is more than powerful enough to handle the everyday needs of a person such as web browsing, streaming videos, making video calls, or word processing. Despite the low price point, this widely acclaimed model is one of the best rated from Acer’s lineup. The build quality is impressive, and even if it is made from plastic, the materials are sturdy enough to handle a bit of heavy use. It is also small enough to carry wherever you go, and it can slide in any bag, backpack, or purse. Since it uses a processor that is similar to what you usually find in a smartphone, this unit utilizes a fanless design. Because there are no moving parts, the computer will run utterly silent so that it does not distract the person using it. Even the best computers for the elderly don’t always come with the best keyboard. If you are looking for alternatives that are easy to use and read, we have you covered. Below you can find the options we consider to offer the best features for the right price. With this nifty keyboard, you won’t need your glasses to read each key since it features a large print that will reduce eyestrain and help your elder relatives type much more comfortably. The keys are also all backlit so that they are easily identifiable even in the dark. You can choose between red, purple, or blue backlit illuminations. The keys are incredibly soft to touch and very responsive. You get quick access keys that will make using the computer a more straightforward task even for persons that are not tech savvy. The quick access hotkeys will take you to the email client, homepage, media player, pause and play multimedia and so much more. There is no need to worry about having to install drivers for the keyboard to work, all you have to do is to connect it to an available USB port, and the device will automatically install everything it needs. The EZSee option provides the user with a USB large print keyboard that is easy to see which makes it ideal for older individuals that have eyesight problems. It is designed using low profile keys, with some of the largest font currently available on the market. The bold black letters on yellow keys will improve the view in low light environments. You also won’t have to worry about the durability of this option since it incorporates high-quality switch technology that is rated for more than 10 million key impressions. That means that the keyboard can handle even the most intense uses and it is built to last for many years to come. Customers love this option, and they are particularly impressed with how easy the keys are to read and even senior users have reported that for people with poor eyesight, this keyboard is everything they could have asked for and more. While it is true that most people nowadays have grown up with computers or smartphones, and have managed to get a grasp of how computers work, the same is not always true for seniors. When looking to get the best senior computer you have to keep a few factors in mind, and that can make the prospecting of the market a bit difficult. There are lots of laptops and tablets on the market today, and it can be quite tricky knowing which one will make a good computer for a senior. Still, if time is of the essence for you and you don’t have the hours to do proper research, the following buyer’s guide will help you identify the features you need to focus on when making this type of purchase. The first thing to keep in mind when purchasing a computer for your grandparents or the seniors in your care is that you need to keep the experience as simple as possible. That means that you should try and get a device that comes with zero bloatware. Even experienced users hate having unnecessary software slowing down the computer. You also need to consider that people that are not experienced with how technology and the internet work are likely to be much more gullible. This can lead to bloatware making them pay for unnecessary and expensive subscription plans for anti-virus software, for example, or other apps. If you can’t avoid getting a bloatware-free purchase, there’s no need to worry as long as you know your way around the operating system. You can check the computer before you give it to the person in mind and clean it from any unnecessary pre-installed software. The display of the computer should be easy to read even in sunny conditions. For this reason, we recommend you go for options that feature a glare-free screen that has enough brightness to handle all weather conditions. This way, your parents might be able to get in touch with you even when they’re working in the garden or resting on the porch. When it comes to the resolution of the screen, you don’t have to go for the highest option available, but we do recommend you keep a few things in mind. For smaller laptops that have a screen size of 11-12 inches, an HD resolution is more than enough. If you get an option with a 15.6-inches or larger display, we recommend a Full HD resolution. What’s more, if you can afford to spend a bit more on your purchase, you can get a computer that features a touchscreen display. The thing that is great about this feature is that it can make interacting with the operating system that much more comfortable for users that have never handled a computer before. With a touchscreen display, there will be no more need to use a mouse or a touchpad which seems to be the biggest obstacle that seniors face when learning to use a computer. If you plan to get a laptop for a person that does not know how to use it, a touchscreen display will help make the learning experience that much easier. If you are looking for cheap computers for seniors, you should also focus your attention on the operating system the product has installed. The two major competitors in this market segment are Windows and Chrome OS. So which one should you choose and why? The main advantage of a Windows operating system comes from the wealth of apps and accessories available for it, and the support it gets from Microsoft. Windows is also more advanced concerning file management and design, allowing you to do more with it. Of course, for seniors that can also be a disadvantage. If you only want a computer for your grandparents to surf the web, stream movies and TV shows, and keep in touch with you, a Chromebook is an excellent choice. While Windows runs most of its apps locally on the hard drive, Chrome OS will use the browser and the internet. The simplicity of the Chromebooks will also make the devices that run Chrome OS much more affordable since the operating system does not require expensive and powerful hardware to run smoothly. Thus, if you want a simple OS where the primary focus is on online content, Chrome OS is a great choice, whereas Windows is ideal for users that want to do more.